The above info came from Who Wants to Know?, and was edited by yours truly (contact me). The images came from otaku central. Have you ever heard of the question, "Do andoids dream of electric sheep?" 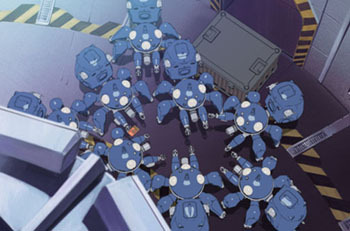 Well, on a side note, it seems that Tachikomas do dream of electric tanks. Tachikomatic Days is a side series that runs concurrently with Ghost in the Shell: Stand Alone Complex. 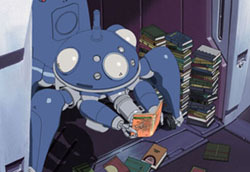 Each segment is a mini-episode of about 2-3 minutes in length that delves into the Tachikoma's collective memory and shows--in a way--what makes them tick. There is one episode for each of the Stand Alone Complex episodes (this applies to both 1st and 2nd Gig), and the Tachikomatic Days episode usually has some tie to the corresponding Stand Alone Complex (such as the big tank of episode 2 of Stand Alone Complex appearing in the episode 2 of Tachikomatic Days). The adventures are more or less an amusing interlude between episodes as the Tachikomas engage in various virtual escapades, but it also helps to demonstrate the constantly-evolving thought processes of the Think Tanks, which are then shown in the series proper.